MTG Commander/Elder Dragon Highlander • View topic - Rivals of Ixalan ....... wait, we are getting cards NOW?!? 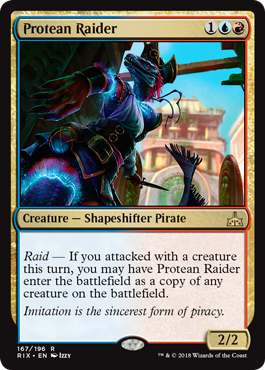 Rivals of Ixalan ....... wait, we are getting cards NOW?!? Post subject: Re: Rivals of Ixalan ....... wait, we are getting cards NOW?!? Dammit, I like the mono-red deck I have. I may have to have two now. This guy is a deck by itself... just ad some lands, mana rocks, additional combat steps and Reroute effects and your deck is ready to go, sir! Not a planeswalker, to my surprise. Still, if you can figure out a way to ramp in WU, players will be scrambling to figure out a way to keep him from attacking or returning to the command zone. Yuuuuuup. Building this one. Blinky with lots of mana rocks and eyes in the sky. Soooooo...Azor...as in Azor-ius? And a Sphinx...this is a Rivals of Ixalan preview yes? 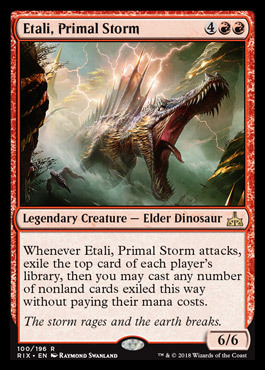 Secretly Ixalan was on Ravnica all along!!!!! No Azor left Ravnica a long time ago, maybe he lost his spark? He is the one that cast the original Guildpact that prevented foreign planeswalkers from coming to Ravnica so it is likely that he is the one that cast the spell trapping planeswalkers on Ixilon. He is atleast 10,000 years old. I am hoping he gets/gets back his planeswalker-ness. 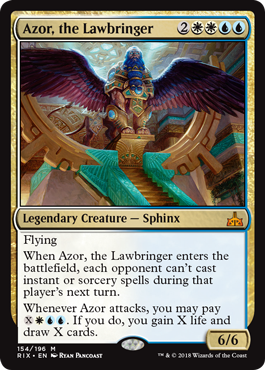 Sudden (actually serious) theory: The Immortal Sun, and by extension the golden city and the plane's weird meddling & imprisonment quirks, is fuelled by Azor's planeswalker spark which he voluntarily forfeited for the creation of these measures. Seems quite likely, actually. MaRo has confirmed there are two planeswalkers in Rivals, and I assume they are Vraska and Angrath, which would mean Azor doesn't get his spark back. I imagine Jace is going to have a hard time with another Sphinx mage though, this could be interesting from a story standpoint. The two planeswalkers in Rivals are Angrath and a G/W Hutali, because brand new characters need immediate colour shifts for some reason. /thinks "Wow that's a lot of loyalty, does the Ultimate cost like 15 or something?" /thinks: "That's kind of underwhelming for an ult"
Edit: It's not so much a colour change as just showing another part of her character, IIRC. She's Naya because the Dinosaurs are. She goes ultimate on the second turn in GW elfball quite easily. That gives a permanent Glimpse of Nature. That sort of card advantage really pays off the longer games go on. Making it creature comes into play rather than cast is a pretty big deal. Almost as big a deal as leaving off the nontoken clause. Ghave would be insane with this. At least it is out of Doubling Season range for a Cast > Ult (barring GWU Proliferate Shenanigans). Oath of Gideon & Doubling Season would do it but you're already into 3 cards and 12 mana so I suppose it's fine. Great card for PW/x deck even if she doesn't ult directly off Doubling Season. Hell, just checked, the draw is optional so you can't even deck yourself with Jace, Biceps Castaway & Doubling Season, merely draw as many cards as you wish. I'll be getting one of these. 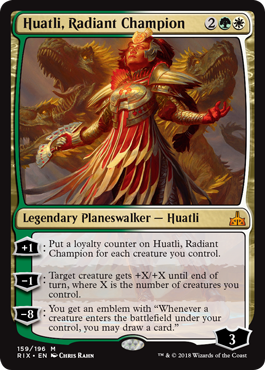 One thing to remember is that depending on how many creatures can supply Huatli with loyalty, it may be possible to use her ultimate twice or more. (Now, whether your opponents will leave off the pressure on her long enough to do that...) The emblem is probably meant to be stacked.